Seattle controlled the game with their defense and was bolstered by a running game that moved the chains throughout the night and kept the clock rolling. Chris Carson earned over half his yards after contact on Monday Night Football, and along with Russell Wilson, the two of them combined for nine first downs and a touchdown on 29 carries. As consistent as Seattle’s running game was Monday night, the Seahawks couldn’t get anything going through the air, even off play action. Wilson connected on fewer than half his passes and spent much of the night just holding onto the ball and surveying the field until pressure chased him out of the pocket. On top of that, his interception at the end of the first half may have been the most inexcusable interception of the season so far. Frank Clark was a force from his end position. He was stout against the run and rushing the passer. Jacob Martin was a factor rushing the passer. 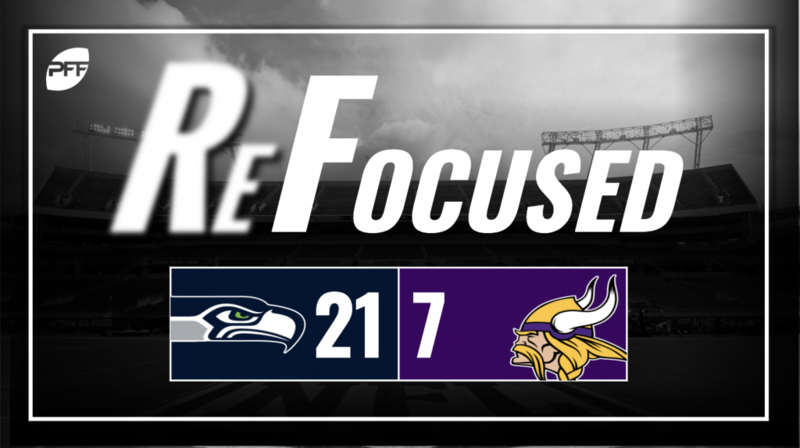 Seahawks cornerback Shaquill Griffin was awesome in the Seahawks secondary and forced the Vikings off the filed multiple times. Minnesota’s defense kept them in the game right up until the end. Sheldon Richardson had a solid game both in run defense and when it came to rushing the passer, tallying both multiple stops and pressures for the night. Holton Hill had a good game in coverage, especially when he was challenged deep. Hill forced multiple incompletions against the Seahawks, including two in the end zone where his coverage forced the receiver out of bounds despite coming down with the football. Kirk Cousins struggled in this one. He had some nice passes, but the Vikings offense just failed to find a rhythm. Dalvin Cook made the most of some of his carries. Wide receiver Adam Thielen made some nice plays to provide a spark for the Vikings’ offense. Seattle ate the clock away all night with a strong rushing performance, backed up by an even better showing from their defense. The Seahawks’ defense had awesome performances from many players. It was a strong group effort.